November is just packed full of not-to-be-missed witchcraft conferences in London. Most witches in England are aware of Witchfest, in South London, on 14 November, but there's another event on 28 November that I believe is just as exciting. Seriously Bewitched is the latest ASSAP symposium at Goldsmith's College, in New Cross, South London, and it is all about witches and witchcraft. ASSAP stands for the Association for the Scientific Study of Anomalous Phenomena. Previous events have looked at ghosts, demons and vampires. What I like about ASSAP events is that the speakers and the audiences have a wide variety of views about whether the supernatural exists or whether strange events have non-supernatural explanations, but everyone is happy to listen to each others’ views and also respect them. The talks are always extremely good. Although the speakers for Seriously Bewitched haven't been announced yet, I have no doubt they will be brilliant. Belief in magical practices is prevalent in most human cultures, from the dawn of recorded history up to modern times. Such figures are represented by the shaman of tribal societies, the Druids of Iron Age Europe up to the “cunning man” and “wise woman” of the Early Modern era. All represent the belief that health, wealth, love and good fortune (along with darker intentions) can be evoked by petitioning higher powers. The term “pagan”, whatever its origins, came to be associated with such individuals from the Post Classical era onwards. The witch hunting hysteria of the 15th through 17th centuries (triggered by social change and fears of heresy) effectively created the modern image of “the witch” that remains influential up to the present. In the early 21st century Wicca, along with Druidism, Heathenism and other lesser known practices such as Goetia represents the most notable contemporary expressions of such beliefs. For those with an interest in the paranormal, the use of magical rituals to reputedly evoke paranormal effects and entities is of relevance. Equally valid for our field of study is a comprehension of the cultural factors that have preserved such “occult” practices in our largely scientific and secular world. 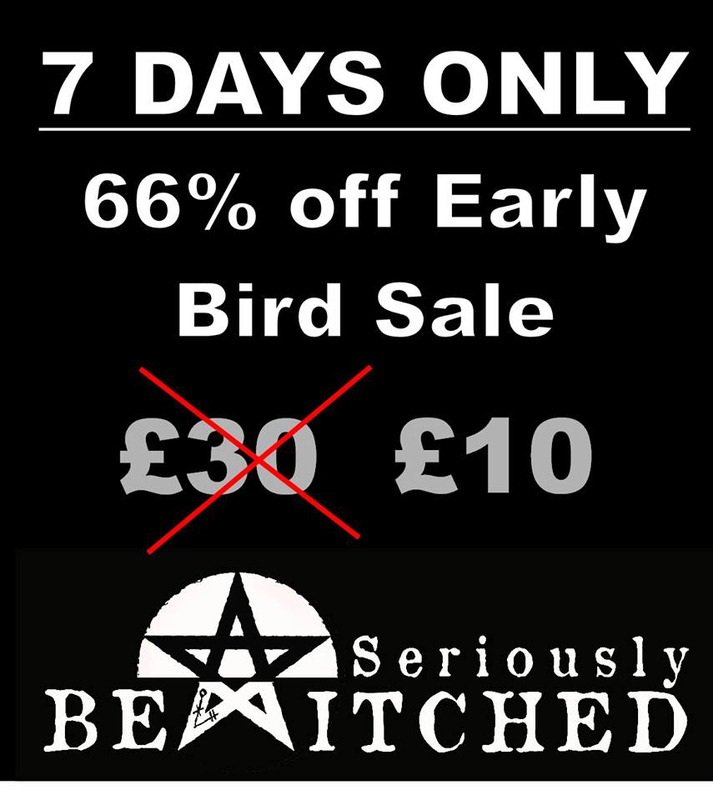 Why you should book your ticket now rather than wait for the speakers to be announced is that for the next week only there is a massive early bird sale for Seriously Bewitched - 66% off ticket prices. That's £10 instead of £30.